Welcome to the Crazy Crafters' Blog Hop with our Special Guest stamper, Su Mohr - we are thrilled to have Su join us this month and so excited to CASE (Copy And Selectively Edit) any project that has been created by her. There is so much inspiration in Su's blog that I had trouble choosing a project but, since I still need more Christmas cards, I chose this gorgeous card. 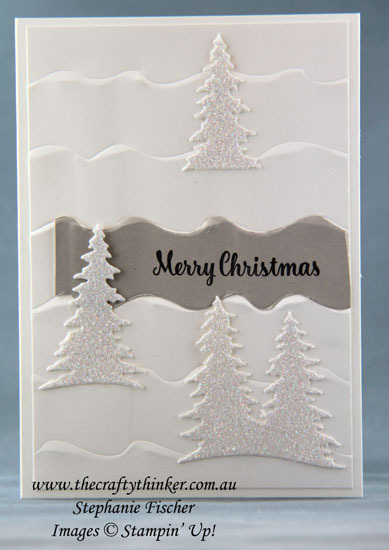 I really like the clever way that Su has used the Ruffled Textured Embossing folder for snow drifts! I maintained the basic card but simplified a little: fewer trees, a mainly white colour scheme, no embellishments. I have to say, it looks better in person than in the photograph! The greeting, from the Starlight stamp set, is stamped onto a piece of Sahara Sand cardstock that I embossed and then hand cut. The trees are cut from Dazzling Diamonds Glimmer Paper with dies from the Card Front Builder set.